Linen-chic: Finally Another Free Giveaway! Well I am now finally getting around to another free giveaway.............hooray! 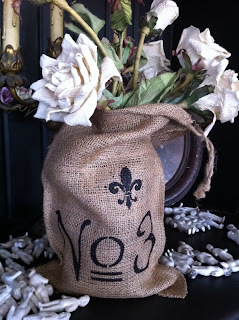 Same as last time, just post me a comment on what you would do with the item if you won it!.............What is it?...............As requested, one of my french number burlap sacs, size 10 by 8 inches..................perfect for many things, let me know what you can think of! A random drawing of names entered will be made a week from today, Tuesday 1st May, and the lucky winner will be announced.....Good luck! My idea for the bags were to use several and hang them from the distressed, shabby rack in my studio. I would use them to organize my art supplies or jewelry findings and then place one of your shabby chic labels on it and stamp out the contents with my vintage stamps. To finish it off, I would tie one of your watch face discs around the top. I would fill it will pretty "guest room" things, and set it on the nightstand in my guest room. Ginny, you are the winner of my free give away, email me at linenchic1@yahoo.com to claim your prize! Would love to win one of your bags! So many options on what I could use it for. Thanks for the chance.